This post falls mainly into the category of “just for fun” but since I first got an immersive Windows Mixed Reality headset (an Acer) I’ve been quite keen to set up a situation where I could track its position using my HoloLens. I don’t really know why and I don’t know whether there’s a tangible use for this, I just wanted to experiment with it. In building shared holographic experiences between multiple HoloLens devices its not too tricky to have multiple HoloLens devices all in one scene, networked together with each device capable of displaying the position, orientation and gaze vector of the other devices or some other shared holograms. For the purposes of this post, I’m using the term “track” to describe the ability of one HoloLens to know the position and orientation of another device but it’s my own term rather than some official one. where you can see a HoloLens floating and displaying its gaze ray. In that particular example the participant was remote and so there’s no local human being attached to that HoloLens but, hopefully, you get the idea. Being able to do this piece of magic ultimately comes down to being able to agree a common co-ordinate system between the multiple devices or at least a transformation from the co-ordinate system of one device to that of another. 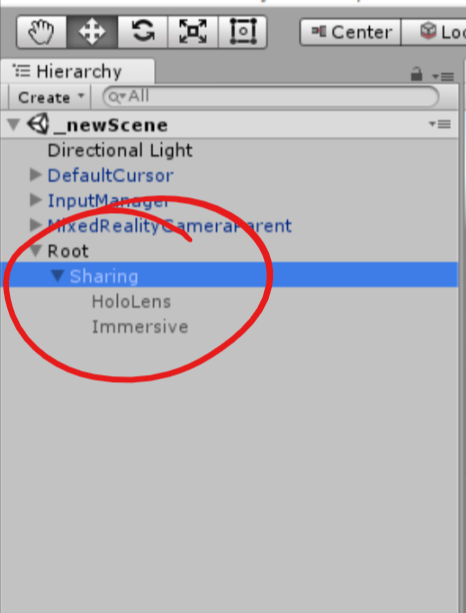 When you first run an application on a HoloLens the starting device (or head) position is taken as the origin of the Unity scene (i.e. a Vector3(0,0,0)) with the X,Y,Z axes pointing to the right, up and forward in the natural way with respect to the device and/or the user’s head. This means that if multiple HoloLens devices are present in a location then, unless they all run the application by being placed in the exact same physical start up spot, they are all going to have different positions in that location meaning that their origin point (0,0,0) will be in a different physical position and their X,Y,Z axes are likely to be pointing in different directions. HoloLens sprinkles in some magic here because the device supports the idea of Spatial Anchors – a blob of data that represents a position and orientation in physical space. 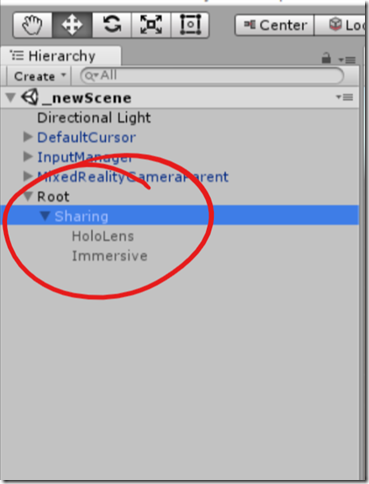 The magic comes when you first learn that a HoloLens can export a spatial anchor, pass it over the network to another HoloLens and then that receiving device can attempt to import the same spatial anchor and locate it in the same space. If that all works successfully (and generally it does) then the two devices now have an agreement about how a (position, rotation) within the room space is represented in their respective co-ordinate systems – this makes it “relatively easy” to consistently display objects. 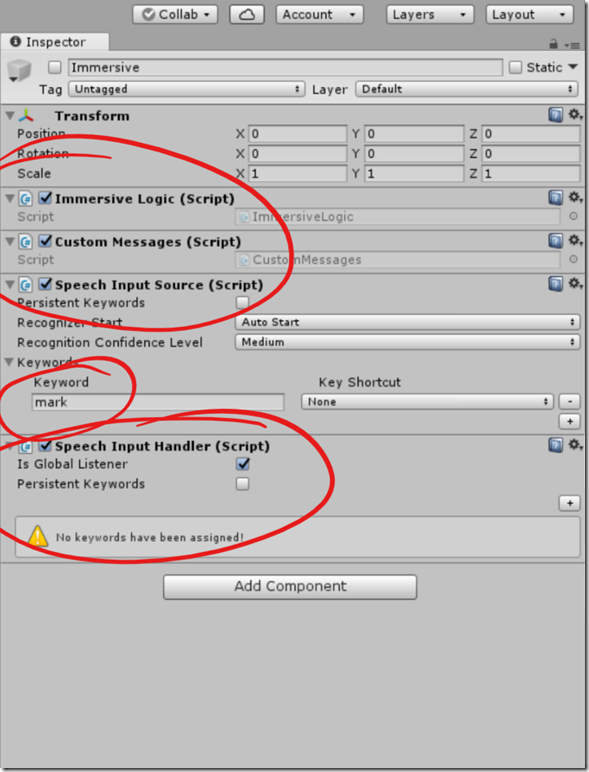 A common way of then achieving that is to have each device maintain a GameObject locked to the position and orientation of the spatial anchor and then parent all content to be shared across devices from that GameObject such that all that content effectively has its origin and its axes determined by the anchored object. This then means that e.g. a co-ordinate of (3,3,3) relative to the spatial anchored object on one device will show up in the same physical place in the world as a co-ordinate of (3,3,3) relative to the spatial anchored object on another device. 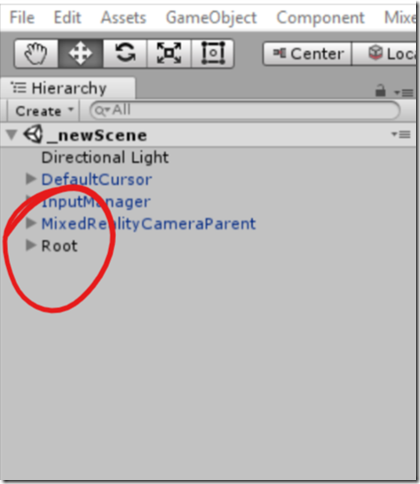 So, for HoloLens this is all good because of the magic of Spatial Anchors. What about an immersive headset? 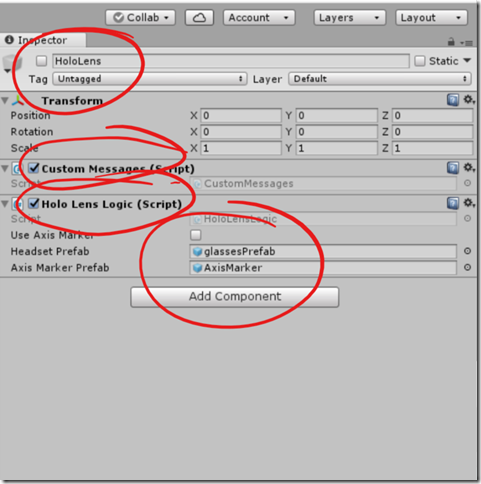 If you’ve looked at the immersive Mixed Reality headsets then you’ll know that they feature inside-out tracking and so it’s perhaps natural to assume that an application running on a PC displaying on an immersive headset would be able to import a spatial anchor from a HoloLens meaning that the code here would be the same as for the HoloLens scenario. As far as I know, that’s not the case and I don’t believe it’s possible today to share a spatial anchor between an immersive headset and a HoloLens although I can’t quite find the definitive link that tells me that at the time of writing. Additionally, it’s relevant to consider that on an immersive headset the origin (0,0,0) and axis orientation (X,Y,Z) is not just determined by the place and direction that the headset is physically sitting at the point when the application first runs. The documentation on coordinate systems explains different the scales of experience as being orientation, seated, standing, room and world and the different frames of reference that make these experiences possible. One of these is the stage frame of reference where the origin is going to be on the floor of the room at the point that the user defined it when they set up their headset. 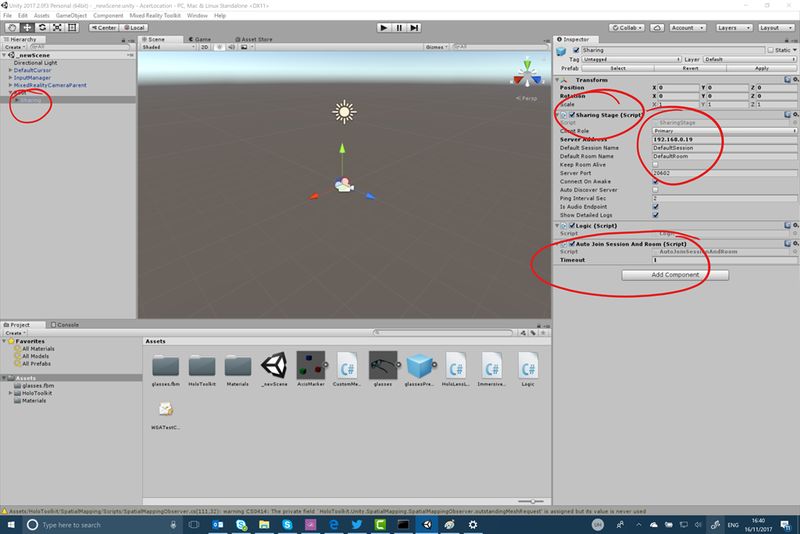 So, for instance it’s perfectly possible for an app to start on an immersive headset at some position of (2,0.5,2) rather than at (0,0,0) as it would on HoloLens. So, if I’ve got a HoloLens and an immersive headset operating in the same physical space then they almost certainly will have different origins within the space and differently aligned axes. In order then for the HoloLens to somehow track the immersive headset in its own co-ordinate system, some form of manual means is going to be needed to agree on some common reference point that can be used to span co-ordinate systems. 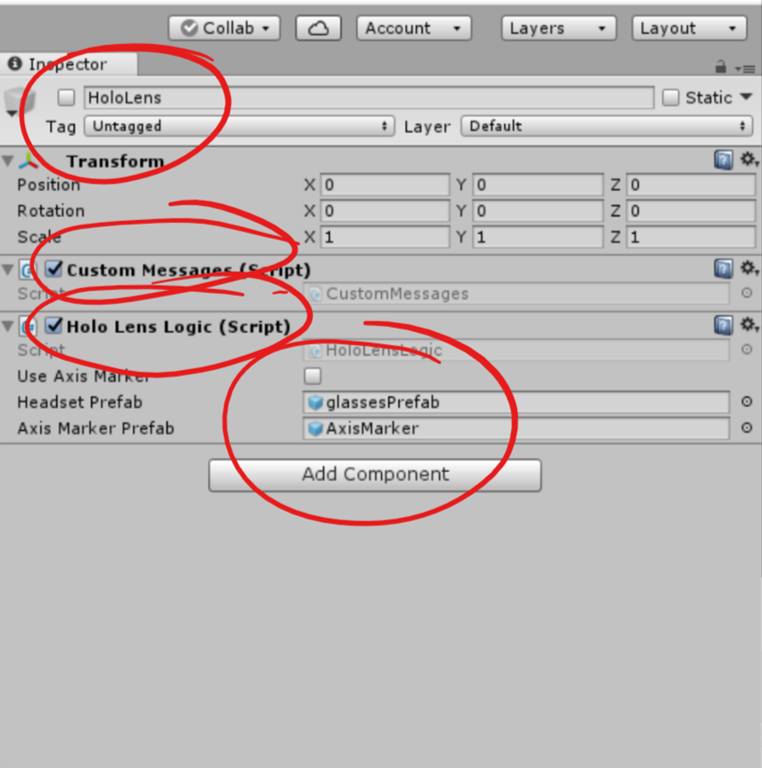 Now, one way of doing this might be to use something like a Vuforia tag but the immersive headsets don’t have a web camera on them and so I’m not sure this would be feasible like it would on HoloLens. 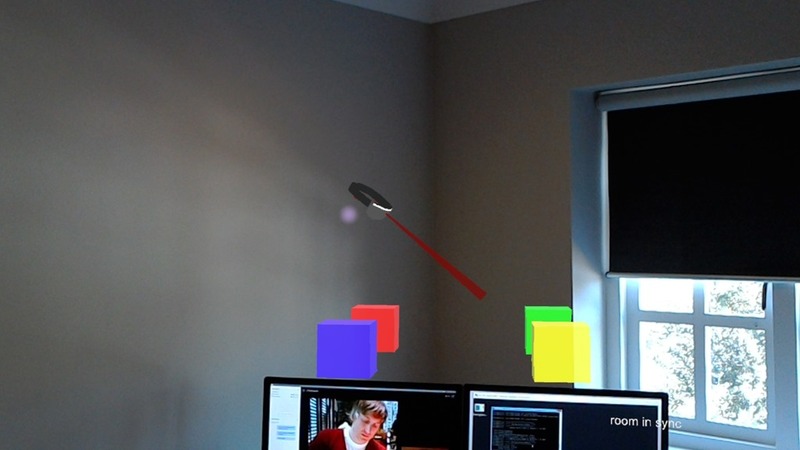 HoloLens app runs up and displays some marker object that can be positioned in physical space. Immersive headset runs up and is physically moved to the same place as the HoloLens marker object with the same orientation. The immersive headset sends its subsequent camera positions over the network relative to the GameObject created at step 2.1 above. The HoloLens headset can now reposition its marker object using the co-ordinates sent from the immersive headset relative to the game object created at step 1.1 above. and, while quite “manual”, this seems to work out relatively nicely and the human being does the work of telling the devices how to align their respective co-ordinate systems. 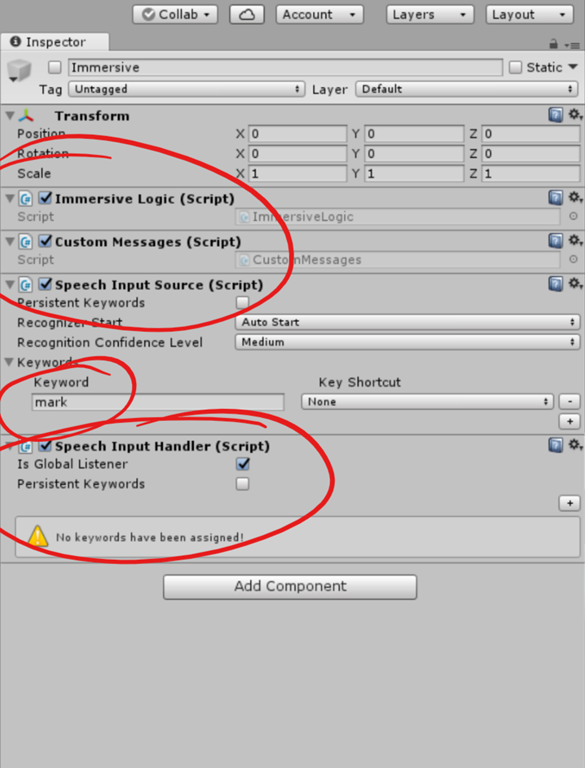 Waits for the speech keyword “mark” and then creates a GameObject to represent the position, orientation of the Camera in space at the point when that keyword is received. Once the common co-ordinate point has been defined, transmits its Camera position and forward vector relative to that GameObject over the network to the HoloLens on every Update(). That’s pretty much it – nothing too complicated once I’d decided on an approach although it took me a little while to figure things out initially and I learned a couple of things during the process. As I said at the start of the post, this was “just for fun” and I’m not yet decided on the use cases for establishing a common co-ordinate system across HoloLens/immersive but something in me would like to take it one step further and add the code to make the immersive headset display the actual position of the HoloLens in its surroundings even if that doesn’t necessarily 100% make sense in an immersive environment. I may update the code to do that at a later point – in the meantime, it’s all over here on github. The Right Way to Maintain a Duplicate PC? Boot to VHD?